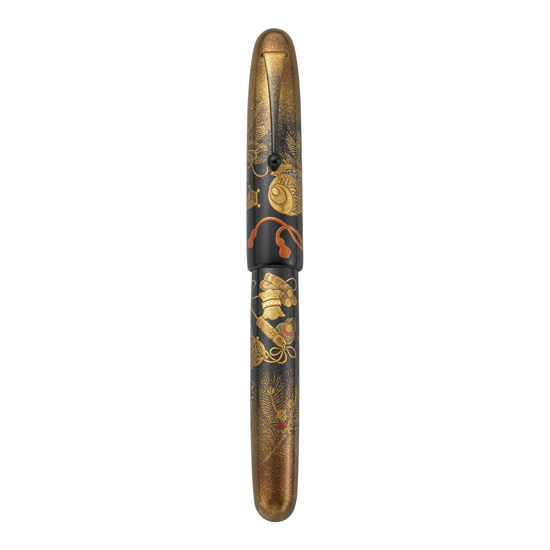 Executed in the charcoal burnished Togidashi-maki-e technique, the Emperor Collection represents the pen maker's art at its finest. Exquisite interpretations of traditional Japanese designs, Emperor Treasure, Autumn Flower, Carp on Waterfall and Rabbit in Moonlight fountain pens are hand painted in gold, lacquer and vibrant color pigments by the world's finest craftsmen. Each is designed with an 18 karat gold and rhodium accented medium or broad nib and presented in a traditional wood gift box from the Orient. The Emperor Collection exceeds the demands of even the most discerning collector and connoisseur.